The many lives of DC's Feline Fatale are explored in a spectacular one-shot with a lead story pencilled by Michael Avon Oeming (Powers)! 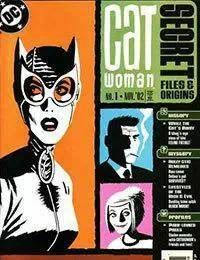 In addition to the lead (inked by Mike Manley), CATWOMAN scribe Ed Brubaker writes all of the stories in this Special, including a Slam Bradley tale, as well as one focusing on a new villain featured in an upcoming storyline, both illustrated by new CATWOMAN artist Cameron Stewart! Plus, Eric Shanower (Age of Bronze) draws a 2-page story investigating the rumors of Holly's death; and profile pages spotlight Catwoman and her supporting cast, courtesy of artists Stewart, Cliff Chiang and more!